I love visiting all kinds of gardeners and their gardens. And I’ll bet you do, too. The gardens I admire most usually aren’t happy accidents. Whether they are formal looking with trimmed hedges and orderly plants, or more casual cottage garden designs with plants spilling out of their borders, they mostly spring from the gardener’s original careful plan plus an organizing system for continued success. 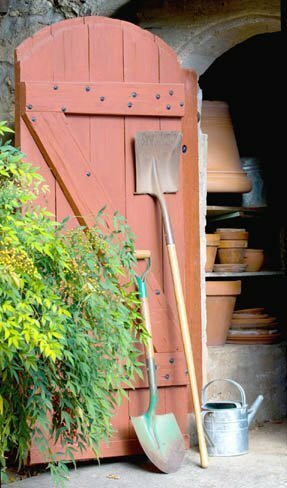 Every gardener has his or her own favorite way to keep things orderly, and after observing these gardeners for some time, I have cultivated my own system to keep my gardening tasks and tools organized. The first tip I’ve learned is the importance of timing in the garden. Everything has its season, so I use a perpetual calendar or a spreadsheet to help systematize the many tasks. A calendar keeps garden chores “on time,” and it helps me plan ahead to keep within my budget. The following includes just some of the tasks I schedule, or at least consider, each season and throughout the year. Lawn maintenance – Aerating, seeding, fertilizing. Tree and shrub maintenance – Fertilizing, pruning. Pest management – Aphid control on new growth, rust and mildew throughout the growing season. Spring – Bulbs (staking, dead-heading), lawn maintenance, planting bare-root plants (roses, berries), starting seeds. Summer – Perennials, annuals, and edibles, lawn maintenance. Fall – Planting spring bulbs, preparation and clean up for winter. Winter – Snow removal, food and water for over-wintering birds, landscape maintenance and improvement planning for next year. If you’re inclined to create a spreadsheet, here’s one way: Set one up with the months listed across the top to form the columns and list the tasks along the side to form the rows. Then for each task mark an X or write the day of the month when it must be done in the appropriate monthly column. Remember, there’s no single correct way to do this. Whatever works for you is the best system to use. When you visit the garden center, you’ll be less likely to be distracted by the variety of plants and better able to build a beautiful garden while sticking to your budget. Of course, you can always leave a little room for whimsy or the sudden inspiration when you see something wonderful at the plant nursery. Evaluate your gardening tools. Whether you’re a minimalist or someone who enjoys acquiring and experimenting with new gadgets, take time to declutter and organize everything you own so you’ll be able to find what you need when you need it and know that it’s in working order. Look for tools that are sturdy but not too heavy to handle. Acquire the basics first and then add extras to suit your situation. To keep tools rust-free so they will last a lifetime, hang them on a peg-board or store them in a box in the garage or shed. Always put tools away clean. Have you ever lost a tool in the garden, only to find it much later, rusted and ruined? Try coating the handles in red or white paint or wrap them with heavy-duty colored tape, so they stand out from the plants and soil when you set them down. -Cotton gloves are useful for light yard work, and they add warmth in cooler months when used as a liner under garden work gloves. They’re washable. -Leather gloves are good for tough jobs such as working with roses or other thorny plants, handling firewood, and clearing branches and brush. Some leather gloves can be washed in soapy water, rinsed thoroughly, then re-shaped and allowed to dry out of direct heat. -Synthetic gloves are thin, flexible, and puncture resistant, making them especially useful for spreading compost, planting seeds, and keeping hands dry and clean. Some are washable; others are disposable. With a little planning and the right tools organized and ready to use, you can enjoy all the benefits of a growing, flourishing garden this year. Geralin Thomas is the author of From Hoarding to Hope: Understanding People Who Hoard and How to Help Them and Decluttering Your Home: Tips, Techniques and Trade Secrets. Learn more at www.MetropolitanOrganizing.com.